Our first frost is not quite two weeks late. This morning the thermometer showed 38 degrees but the windshields were covered in ice. Everything I touched was slightly icy. I am out of the habit of wearing gloves so I just had to deal with it today. Otherwise, beautiful morning with just a pinch of moon. This morning I had to move the main layer flock. Apparently it takes me 2 minutes to collect each length of fence, three minutes to stand each back up and another 8 minutes to move the house, feeder and drinker. I don’t know how to speed that process up but that’s what I have to do. Even on flat land where I can build a simple square I’m slower than I would like. I’ll be sure to tell you what I come up with if you promise to offer any tips you have. ← The Adventures of Compost Calzone in the Wild West! I’m not sure you could cut down the time per fence length, so the obvious answer seems to be to move fewer lengths. I’m not sure how you do that, though. Helpful, aren’t I? Salatin uses a kind of double circle set up when he’s moving those big A frame shelters, which I guess saves time at the time of the move, though it doesn’t save time overall. 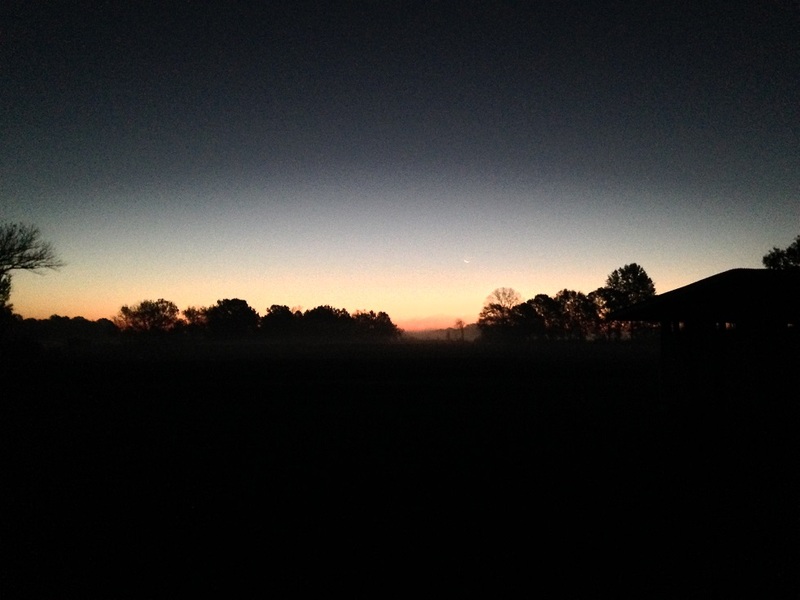 That is a beautiful pre-sunrise you captured this morning. I need to get up earlier. What breed of layer flock do you keep? We mostly alternate breeds by year. Our initial flock was a big mix so we could see what was what. We got SLW, NH and Barred Rock along with a few Americaunas. There may have been RIRs in there too. There was no clear winner there but the barred rock we had seemed to have the most trouble with the heat and the Americaunas seem to only lay about 150 eggs. So we hatched eggs from the NH that were still laying at 3 years and are continuing that line. I can only hatch so many eggs at this point so the main flock is entirely sourced off-farm. At some point we’ll step up our incubation but for now hatching 30 seems to meet our needs for our little hobby. The next year we got hybrids. They were getting so much bad press we had to see what all the fuss was about. Turns out, they are awesome. I would have zero reservations about putting hybrids out on pasture again. But we think (and this changes year by year) we want to adapt our own localized genetics from a NH base. The coming year’s production flock are Silver Laced Wyandotte. They can be a little flighty but they have a tight comb and do well in cold weather (in terms of health). They seem to be worth about 250 eggs/year and that’s good enough for our needs. Next year we will switch it back again and will probably order New Hampshires again to put fresh blood in our flock. If you are looking, we REALLY liked all of the birds we got from Central Hatchery 2 years ago. That flock has been great. Just remember, whatever breed you choose, health comes from the brooder. Give them a good start and keep them clean and well fed and they’ll thank you for it.